The site of Kingman was on the Ninnescah crossing of the Hutchinson-Medicine Lodge Trail. There in 1872, Norman Ingraham located his house, which he had hauled from Reno County. He hoped the place would become a city and he named it Sherman. There stood the town of Sherman with one shack and one cottonwood tree, waiting to become a city. J.H. 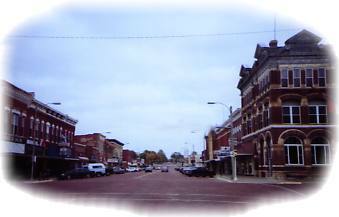 Fical and his brother started a new town at Sherman in 1874 and named it Kingman. The county, the town, and a township were all named for Samuel A. Kingman, Chief Justice of the Kansas Supreme Court. Only Sherman Street remains to remind one of the town's first name. Even the first hotel had its name changed from "The Sherman House" to the "Kingman House." Pure rock salt was discovered in 1887 and workers moved to town, so additions to Kingman were hastily developed. This Boom-town was called the "Queen of the Ninnescah", ironic to Samuel A. Kingman's Fourth of July oration in 1878 at Kingman, "Our state history has no nobler name," said D.W. Wilder, than Kingman's and "it will live with the life of the State." Hunters and non-consumptive wildlife users alike will find plenty to do on Byron Walker Wildlife Area. The habitat is diverse, including streamside woodlands, shrub plots, native prairie and food plots. Most of the grassland has been enhanced with tree and shrub cover strips adjacent to food plots. The First National Bank building is listed on the National Register of Historical Places.